The subject of "Area 51" has been denied by the United States Government for years. Though the conspiracy community was rocked by an admittance of a classified area, and an exempt order by a Presidential Determination signed by President Clinton in 1995. This "determination" by the President, said that the area near Groom Lake, Nevada, or known to most people as "Area 51", was exempt from all Federal, State, Interstate, or Local Hazardous laws that might require the disclosure of classified information. 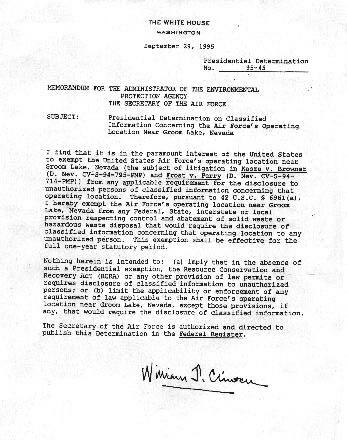 Below is the full text of the order signed by President Clinton exempting Area 51 (Groom Lake) from releasing its environmental reports to the public. operating location to any unauthorized person. Consistent with section 6001(a) of the Resource Conservation and Recovery Act (RCRA) (the "Act"), as amended, 42 U.S.C. 6961(a), notification is hereby given that on September 13, 2002, I issued Presidential Determination 2002-30 (copy enclosed) and thereby exercised the authority to grant certain exemptions under section 6001(a) of the Act. 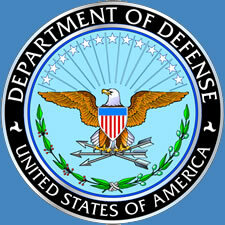 Presidential Determination 2002-30 exempted the United States Air Force's operating location near Groom Lake, Nevada, from any Federal, State, interstate, or local hazardous or solid waste laws that might require the disclosure of classified information concerning that operating location to unauthorized persons. Information concerning activities at the operating location near Groom Lake has been properly determined to be classified, and its disclosure would be harmful to national security. Continued protection of this information is, therefore, in the paramount interest of the United States. The determination was not intended to imply that, in the absence of a Presidential exemption, RCRA or any other provision of law permits or requires the disclosure of classified information to unauthorized persons. The determination also was not intended to limit the applicability or enforcement of any requirement of law applicable to the Air Force's operating location near Groom Lake except those provisions, if any, that might require the disclosure of classified information. # # # This is the Letter to Congress: Presidential Letter to Congress Text of a Letter from the President to the Speaker of the House of Representatives and the President of the Senate January 30, 2002 Dear Mr. Speaker: (Dear Mr. President:) Consistent with section 6001(a) of the Resource Conservation and Recovery Act (RCRA) (the "Act"), as amended, 42 U.S.C. 6961(a), notification is hereby given that on September 18, 2001, I issued Presidential Determination 2001-27 (copy attached) and thereby exercised the authority to grant certain exemptions under section 6001(a) of the Act. Presidential Determination 2001-27 exempted the United States Air Force's operating location near Groom Lake, Nevada, from any Federal, State, interstate, or local hazardous or solid waste laws that might require the disclosure of classified information concerning that operating location to unauthorized persons. Information concerning activities at the operating location near Groom Lake has been properly determined to be classified, and its disclosure would be harmful to national security. Continued protection of this information is, therefore, in the paramount interest of the United States. The determination was not intended to imply that, in the absence of a Presidential exemption, RCRA or any other provision of law permits or requires the disclosure of classified information to unauthorized persons. The determination also was not intended to limit the applicability or enforcement of any requirement of law applicable to the Air Force's operating location near Groom Lake except those provisions, if any, that might require the disclosure of classified information.